Third time’s the charm. Or so they say. The past two posts have focused on symphonic works in triple time from the late nineteenth and early twentieth centuries, the period that is richest in terms of educational and interesting examples of orchestration. In the most recent one we listened to Jean Sibelius’s Valse Triste (in the post entitled Triple time 2) and specifically how Sibelius sets up the triple rhythm so simply in just the first few measures. To start in this post we’ll begin with a later passage in the same piece. In the first portion of this well-known piece by Jean Sibelius, the composer has the strings shifting between modes. We’re not quite sure if it’s in a major or minor tonal center. Furthermore, even if we were sure, we’d still have some question about exactly which minor mode it was. Also in the opening section the the first violins and cellos play the melody in octaves, with the second violins and violas playing rhythm chords on two and three (the offbeats). After the melody finds a resting place, temporarily at least, on A-flat major in measure 39, there’s a brief slowing for a change to a G major applied dominant. The composer instructs all but the lowest strings to play these staccato notes very lightly at the point (tip) of the bow. Notice that just as the melody in the strings has consisted of sustained notes, the shift to an even softer, but slightly more urgent waltz-like tune is introduced. And, note that, for a few measures at least, it has a beat of one-two-(no three)-and, that is: quarter note, quarter note, eighth rest, eighth note. This is a familiar waltz rhythmic pattern even in this slow – and very light – expression. Once a composer decides on a melody in triple time there are some features that just fall into place. We’ve seen this frequently the past few posts. Now let’s listen to the opening of the third movement of Gustav Mahler’s Second Symphony (known as the “Resurrection”). From the outset he is clearly trying to throw the listener off the rhythmic trail, at least for the first few notes. First there are the very short solo timpani notes, which, taken as they are out of context, provide no idea of the rhythm. After a brief pause the composer gives us the same perfect fourth leap again, but this time the first note is given a little longer to sound. Finally we get a repeating rhythm of three-one. It is much slower than the example we heard last time from Dukas’s The Sorcerer’s Apprentice, nevertheless, the rhythm is the same. And, once we hear it two times, Mahler brings in a bassoon on two and three. This is immediately followed by the other bassoon duplicating the timpani, the bass drum on the downbeats, and a clarinet playing a short note on three and a longer, sustained note on the ensuing one. In the next bar the English horn joins the second clarinet, the first clarinet enters with its sixteenth note “slow trill,” and the third clarinet joins the first bassoon on its notes on two and three. Before we even get a chance to know what’s hit us in just these few seconds, the both violin sections enters on the third beat with the beginning of the sixteenth note melodic line. Mahler has mushroomed this short introduction from just the timpani to much of the lower reeds. The timbre of this group of reeds is typically woody and the passage is in the same range as the violin theme. But even more rapidly than the crescendo has grown, we are aware that it all has disappeared. For, after one full measure of the violin theme, all the winds suddenly stop and even the whole second violin section drops out, too. This leaves us with the first violins playing piano and the violas, cellos, and basses supplying the remainder of the rhythm. A perfect example of an orchestral subito piano. Note how beginning in measure sixteen when the violins hit the top of this melodic range, they start a descending pattern with some strong accents on the downbeat. This descending line is mirrored in the pizzicato strings as the first note of each measure rises and the chords are spelled out on two and three in the unison violas and cellos. And, only at the end of this phrase does the second violin section enter, now pizzicato to complete the chords on the three beats of measure 19. Now that the pattern is established, Mahler is free to move the upper string pizzicatos around as needed. For a few measures they’re on one and then they become the off beats on two and three. It is light and crisp, but elegantly engaging writing in this modal sounding melody. One last thing to note is that the same way Mahler added to the opening crescendo by increasing the number of lines, once the flutes enter in their lowest octave playing pianissimo, he has them “die out” (diminuendo) one by one on the same line. In measures 27 and 28 all three are playing the melody. In 29 the third flute drops out and then in 30 just the first flute plays the line. This ends on middle C where the second violins pick up the sixteenth note pattern. Gabriel Fauré’s Dolly Suite was originally written for piano four hands and premiered in 1898. It was orchestrated by Henri Rabaud and this orchestration had its premiere in 1906. The work for a relatively standard orchestra in this fourth movement shows some interesting options for initiating the triple rhythm. The most obvious of these is the melody itself in the first two measures with its notes on one and two. Yet, there are other edifying features. 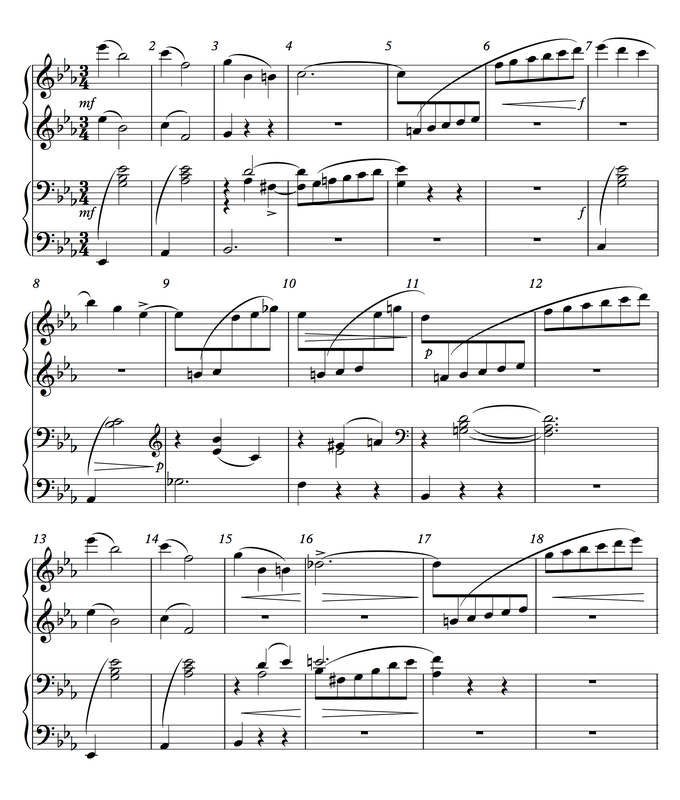 I’ve included the four-hand version score. Note in Example 4 that the second part begins the first three measures with the bass notes on one and a chord on two. Rabaud transposes this to pizzicato lower strings for the one. As we have heard and seen, this is the fairly standard device. Yet, Rabaud adds three octaves of harp on the downbeat with the right hand (of the second part) chords played on two with three horns. Nothing else, save for the melody, sounds on two. This technique of bringing in one or more instruments to get the triple meter moving and then drop them out is familiar by now. We saw this method in the last post in The Sorcerer’s Apprentice by Dukas, the third movement of the Tchaikovsky Fifth symphony, and in this post in the Mahler above. Example 4. Gabriel Fauré, Dolly Suite for piano four hands, No. 4 Kitty-Valse (Measures 1-16) When the same second piano part occurs in measures 7-8 and on the repeat in measures 13-14, Rabaud brings in the horns each time to make sure we know both the beat and the harmony. The rhythmic clarity is important in these passages because they follow one or two measures of runs with not much else in the way of rhythm guidelines. Because there are no instruments initiating notes (attacks) on the third beats of these measures, this is a useful and intelligent addition. This shift from triple to duple meter is what the hemiola is. Look at Example 6. This is from the “bridge” section of the dance. See how the notes are the same in measures 2 and 3, but the rhythm is not. In measure 2 there are three beats to the bar. In measure 3 there are two beats – in the same amount of time. This is what the hemiola is all about. It was used frequently in Renaissance music. And, if you remember your Beethoven, that bit in the scherzo movement of the Eroica Symphony might be the same or a very similar technique. I’ll wrap up this discussion of triple meter in my next post. We’ll examine a dance piece by Alexander Glazunov and then review one of the 800-pound gorillas of the waltz. Please let me know if you have any questions.